It took some time before I got to writing a blog again. So this will be more like a resume, for detailed and more personal reports go to Eveline's blog and use Google translate (installed) if necessary. 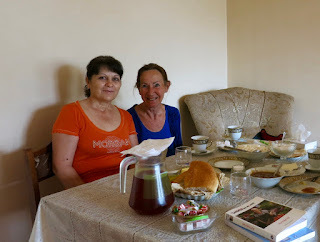 After the leisurely day in Chiva we spent eight more days in Armenia. The first day after Chiva we found a hotel along the main road on a deserted stretch of the road just past the junction with the road to Jarmuk. It had basic facilities with not all amenities working properly. But they had cool beer and served a good meal for dinner. No breakfast though, the kitchen aid simply wasn't there in the morning. Cycling without breakfast appeared to be no problem. The road to Sisian, our next stop, took us over a high pass (2200) again and we were very tired and very happy to find lodgings in Diana hotel. Old glory, a suite and good service. Then up the mountain again to Goris, which we reached plunging into a deep valley against a scaringly stormy wind. By now we concluded among ourselves that we were fed up with all the climbing. And as we realized that we had to get out of this hole where we were now via the same road as we had come in order to reach Tatev we arranged a car to get us out of the depth and up the mountain. Two bicycles on the roof rack of an old Wolga car, no problem. Then only a few kilometers downhill to Harsnadzor hotel and guesthouse. This hotel is on a steep slope in the canyon before Tatev and it consists of a number of barrelshaped rooms or apartments , some only holding a double bed, some with bathroom. We stayed 2 nights. Nice place to hang around for a couple of days, lousy service. We had to pay the full, rather high, price, though our barrel was not yet completely finished. Not totally satifactory. Tatev is famous because of two things: first, there is a monestary of which the Armenians are very proud. Second, to get there you have to descend into a 600 meters deep canyon over a good road, then cross a natural bridge, the devil's bridge, and climb up the 600 meters again over a very bad dirt road to reach Tatev monestary on the same level on the other side. Some years ago Italians built “The wings of Tatev”, the world's longest aireal tramway (cable car) over the canyon, which now is an attraction on its own. We rode it, which was impressive, and visited the monestary, which could not impress us that much. To get out of the canyon where our barrel house was we arranged transport again. 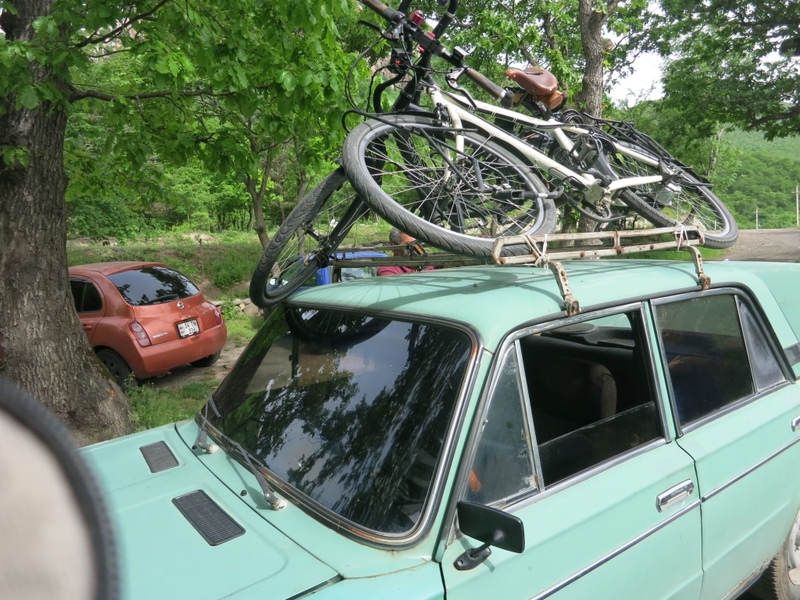 This time an old Lada showed up, smaller than the Wolga. Two bicycles on top, it appeared to be possible. 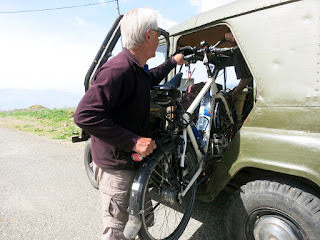 The car took us 1200 meters up to the pass, it had to stop once to refill the radiator as the engine was overheating. The whole journey was over this dirt road and so was the descent from the pass, which we did on our own wheels and continued for another 20 kms. Slowly we got further down and reached Kapan, where we stayed in an ex-soviet hotel. The sincerely looking lady at a little desk on the landing is still there. In Shikagogh, less than 30 kms but over a 1000 meters of often too steep ascent, we had “booked” a B&B (someone had phoned a friend). It appeared to be a normal, very basic house where we slept in the bed of the owners, who disappeared downstairs for the night. Very kind and gentle people, who on our request arranged an ex-soviet jeep to carry us up to the pass at 2300 alt. From there it was only down to Agarak on the Iranian border, where we found, 4th trial, an amazingly nice place to stay. 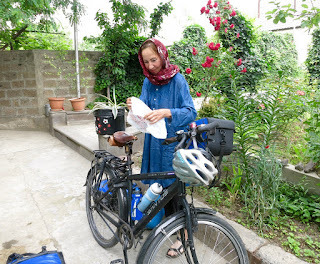 The next morning Eveline got on her bicycle wearing a head scarf!